Years ago, M&S used to make the most delicious prawn fishcakes. These mysteriously disappeared off the shelves and left me greatly saddened by their demise as I thought they were the best things ever. I still check the fishcakes section every time I enter M&S in the vain hope that they might see the error of their ways. However, after many years of emerging from the shop with a heavy heart and empty shopping bag, I thought I'd try and make my own. These are a surprisingly good subsitute, and my first ever fishcakes! For me, the secret lies in keeping the prawns reasonably chunky. That way you get a delicious bite and change in texture as you eat them. This is much, much easier if you have everything ready to go in advance, so peel, chop your potato into chunks and boil for 20 minutes, until soft. While the potato is boiling, slice the spring onions, deseed and finely chop the chillis, roughly chop the coriander and parsley, adn beat the egg with the salt, cayenne and black pepper. Once the potato is cooked, drain and in a medium-sized bowl mash it until it is smooth. Add all your pre-prepped ingredients and mix well. Next sprinkle the flour on a plate and, using your hands (which I hope are clean? ), mould the fishcake mix into 8 little cakes. Place them in the flour so they are lightly but fully coated, then heat a frying pan with about 1 dsp olive oil. 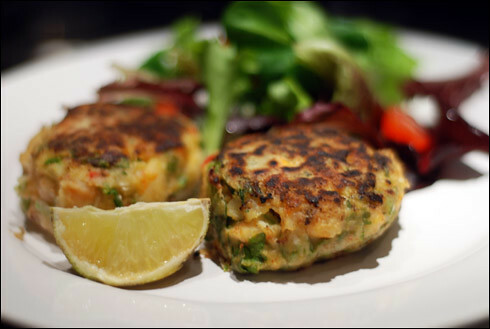 Once hot but not smoking, fry the fishcakes for 10 minutes, turning every two to three so they don't catch. Serve with a green salad, a wedge of lime and some sweet chilli sauce.